How to Retrieve the Installed Speech Recognizers in Windows Phone? 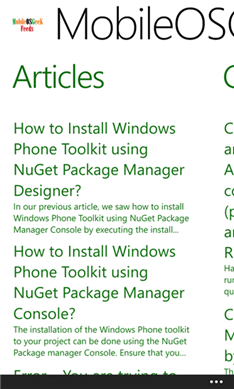 I am happy to announce that the 1st version of the MobileOSGeek Feeds for Windows Phone 8 is released and is now available for download from Windows Phone Store. The MobileOSGeek Feeds App is a simple RSS reader app that lets you keep you updated on the latest blog posts from MobileOSGeek.com. The app was developed using Windows Phone App Studio. Know more about MobileOSGeek Feeds App for Windows Phone and download from Windows Phone Store.